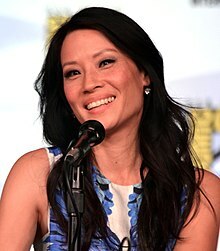 Lucy Alexis Liu (born Lucy Liu; December 2, 1968) is an American actress, model, airtist, an occasional film producer an director. She acame kent for playin the role o the vicious an ill-mannered Ling Woo in televeesion series Ally McBeal (1998–2002), for which she wis nominatit for a Primetime Emmy Award for Ootstaundin Supportin Actress in a Comedy Series an a Screen Actors Guild Awaird for Ootstaundin Performance bi a Female Actor in a Comedy Series. Her film wirk includes starrin as ane o the heroines in Charlie's Angels, playin ane o the enemies o The Bride in Kill Bill, an appearances in Payback, Chicago, an animatit hit Kung Fu Panda. In 2012 Liu jyned the cast o TNT series Southland in the recurrin role o Jessica Tang, for which she wan the Critics' Choice Televeesion Awaird for Best Drama Guest Actress. In 2008 she starred in her ain televeesion show, ABC comedy-drama, Cashmere Mafia, which endit efter ane abbreviatit saison. The shaw wis ane o anly a few American televeesion shaws tae hae an Asian American series lead. She is currently co-starrin in Sherlock Holmes–inspired crime drama Elementary, playin Joan Watson. ↑ Ogunnaike, Lola (October 13, 2003). "The Perks and Pitfalls of a Ruthless-Killer Role; Lucy Liu Boosts the Body Count in New Film". The New York Times. Retrieved 2007-11-01.